If you’ve seen Degrassi Talks… On Alcohol on TV, you’ve heard some stories these teenagers told to Neil and the other Degrassi actors. But this wasn’t Wheels talking. It was Neil Hope, the real person behind the kid from Degrassi. No more hiding behind a made-up character. And it wasn’t easy. It never is. It wasn’t when he was interviewing Nathan about his life with alcoholic parents for Degrassi Talks. Nathan is a very quiet, very withdrawn person. Even with a microphone it was hard to hear what he was saying. So series and Degrassi founder Linda Schuyler suggested that they turn the tables. Literally. They turned the camera around and pointed it at Neil, and Nathan asked him questions about what he went through growing up in an alcoholic home. And Neil talked and Nathan listened. 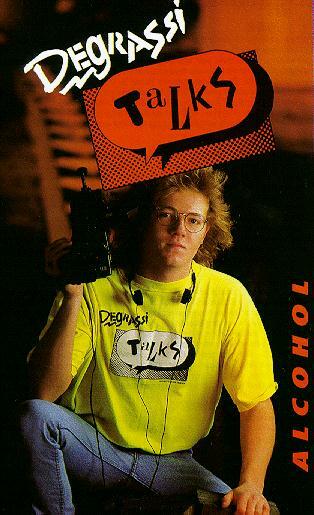 Neil did that a lot as he traveled around western Canada interviewing other teens about alcoholism. Not fell ashame about it. For many kids whose parents are drunks, this is what is all about. Try telling them it’s not their fault, that they have nothing to do with why a mother or a father, or a grandparent, has to drink and get drunk, why they can’t quit the habit, why the bottle is always more important than the kid is. Try telling kids that they can bring their friends home after school because even if their friends see their parents passed out on a floor, or in a boozy rage, it’s nothing for the kid to be ashamed of because it’s not his fault. Neil knows that. He never never brought friends home after school because, he says, he wanted to deny it and everything else that was going on around him. And if his friends saw his mother, then he would have to see her. Really see her. It was easier to pretend. Pretend to the outside world, that is, because there was no escape from drinking at home. Neil is the baby of the Hope family, the fifth kid, the fourth son. Both his parents were already alcoholics when he was born September 24, 1972, in Toronto. He figures it probably wasn’t long after when his dad left home for the last time. Anyway Neil has no memory of living with a mother and a father together in the same house. For him it’s always been either/or. The kids would stay with their mom for as long as they could take it, then they would move in with their dad. When things got too tough there, they’d all shift back to wherever their mother was living. That’s his description. He laughs when he says it. But it’s not a real laugh, not natural. It’s hollow and it sounds bitter. In the television episode of Degrassi Talks… On Alcohol, you can see a photo of a laughing young boy named Jimmy and the newspaper articles which reported how his body was found among a bunch of trash in the dumpster in that rough part of town. He had died from alcohol poisoning. He was only 15 but alcohol killed him. Neil knew him. He was the son of one of his mother’s drinking buddies. His mother had a lot of them. They drank a lot. And they always seemed to be fighting. The worst time was when he was only 5 or 6. The family was living in the east end then and his mother would get drunk whit her friends and turn up the country music and sing along. Because it also him remember when the police car and the ambulance pulled up in front of their house because his mother had slit her wrists. That’s the memory that sticks, that’s always there, that’s never going away, that won’t fade with time. There’s always one memory with kids who grow up in alcoholic homes, one memory that hurts the most. For some kids it’s one about shame, when your father passed out face down in your birthday cake in front of all your friends. For others, it’s the time a mother “forgot” to pick them up from a skating lesson and left them waiting in a snowstorm for hours. It’s a moment when someone who is just a kid, who should be cared for, looked after, protected, always laughing, feels totally helpless. And afraid. Really afraid. Not the fear that comes from remembering a scary movie, but the fear from the much worse realization that a kid is caught inside a terrifying story, that he can’t get out, that there is nothing he can do to fix it, make it better, or change anything. Neil was 5 when he knew that. His sister Cheryl, used to make a lot of the lunches for everybody; his brothers – Stacey, Brian, Danny – looked out for him too. But even when they tried, the boys never succeeded in breaking up any of the fights and they never stopped their mother from drinking when she set her mind to it. When Neil was younger and his mother was in one of her binges – when she would get up at about 10 in the morning and drink all day till she passed out, usually about midnight – he used to try and distract her, ask her to go for a walk, offer to take her to a movie. But Neil adored his dad. From the time he was 8, Neil wanted to be an actor. Or director, Or just a part of movies, television. He was always watching TV. He wanted to be part of television. He took an on -camera training course, which his father paid for, and had professional photographs made up. He went on auditions; he was determined. His brother Stacey’s girlfriend worked in a shelter for battered women not far from the Playing With Time offices. She saw a huge sign they had in the window calling for kids to audition for parts in a television show. Neil was 10 when he got a part in an early episode of the Kids of Degrassi called Martin Meets The Pirates. It was supposed to be a one shot deal, but he stayed on as Griff, and later when the series shifted to junior high, took the part of Wheels. His father was fiercely proud of him. So was his mother , only she never said as much. When she’s not drinking she is a private person who doesn’t talk about feelings or emotions much. Neil remembers finally asking her, when he was 12 or 13, whether she was proud of him. “She said , ‘ Of course I am, ‘ and that was that,” he recalls. But it wasn’t. Not for Neil. So, out of all the kids, Neil was the “good” one. In fact, thanks to the Degrassi pay cheque, he was the family’s “saviour”. He makes a face when he says that. “I was the saviour because my mom was getting money from me to buy the booze. Or else she would spend all her money on booze and I would have to buy the groceries”. They were there because of Danny, who was two years older than Neil, and very, very angry. This is what happens in a lot of families where one or both parents are alcoholics. Whether they think they are or not, the kids are all reacting to it, and usually all in different ways. Some kids become like Neil, trying to always be good. More than good, they’re the ones aiming to be perfect because it’s the only way they know how to fight the shame they feel. Other children are more like Danny. They rebel and take out their anger on other people and on society. Some, like Stacey, retreat into humour. They always clown and joke around to try and forget their hurt. Others pretend nothing’s wrong, and some – like Neil’s sister, Cheryl, the eldest and only girl of the family – take on the role of an adult, in this case of the mother, to try and hold together the family. But it all fell apart after Brian died of cancer. Danny got very, very quiet. Brian had been his favourite brother. And their mother was inconsolable. It is a terrible thing for any parent to have a child die before they do. Some people believe there is nothing worse that could possibly happen in this life. But Neil’s mother had an even heavier burden. She had been drunk the night he died in the hospital – “I don’t think she can ever forgive herself for that”, Neil says, – and night after teary, grief-stricken night she drank to forget. And she drank to punish herself. And because the sorrow and the shame and guilt were too much to bear sober. But really she drank because she was an alcoholic. And if they are not in recovery, that is what alcoholics do. Drink. Some children of alcoholics think that if they were better people – better at school, or better at sports, or better at cleaning up – then their parent wouldn’t drink. And a lot of alcoholic parents do blame their kids (or other people) for their drinking. Some will say they drank that day because their child didn’t get a good enough report card, or made too much noise, but that is just not true. These are excuses, never the reason. Alcoholics drink because they must, because they can’t say “no” even when they know their drinking is killing them. Neil’s dad died in 1987. He died of cirrhosis, a disease of the liver. The booze killed him. When his doctor had warned him about his health, he cut out drinking entirely. Cold turkey. Just pop, milk or coffee, something he never usually drank. But before he died, he asked Stacey to pick up a case of beer and a bottle of rye for him. Those were his drinks. He complained that night of not feeling well and Stacey told him if he weren’t feeling better in the morning they’d go see a doctor. At 5 a.m. Stacey found him, dead. “It was as if he knew he was going to and bought the booze because he decided to go out on his own terms”,Neil says. But sometimes things get even more complicated when an alcoholic parent dies. No matter how much they were loved, there is always guilt mixed up in the grief. There is a guilt because the alcoholic’s children can never forget how they felt when they saw a drunken parent sprawl, fall, slur ugly, hateful things. No matter how much they loved that parent, they also experienced moments of intense rage, of pure hatred for that person. All of them, whether they admit it or not. Neil didn’t admit it, but he does say now he was big on denial because some things were obviously eating away at him. Playing With Time, the company which made the Degrassi television series and which has made the Degrassi Talks series, had begun a Foundation. And the Foundation had money which it made available in grants to the kids on the show to make their own productions. It was Neil, the fledgling director, not the child of alcoholics, who applied for – and got – a grant to make a documentary about having an alcoholic parent. He was being practical and paying attention to the old rule of the first-time writers – write about what you know. He turned the camera onto the mother of his buddy and co-producer Bill Parrot, who played Shane in the series. And Rebecca Haines, better known as Kathleen to viewers of Degrassi, talked candidly about what she went through before her dad sought treatment for his alcoholism. Then Neil sat down in the hot seat and talked about how he felt having one parent who died because of alcohol and another who is living for nothing but alcohol. But as it turned out, The Darker Side was just the first step in his healing. His father’s death had shaken him more than he had admitted. For the first time ever, he took to the bottle. He drank enough to get drunk three or four nights out of the week. These days he’s sure he’s probably a “normal” drinker, somebody who can have a couple of beer every so often and not need any more. But many people believe that if a person has one parent who is alcoholic he or she has a 50 per cent chance of becoming an alcoholic himself. Two parents and the odds skyrocket up to 80 per cent. Experts have also noted that some families seem to have a “streak” of alcoholism running through them that can go back generations and generations. Neil’s family is like that. Both his mother’s parents were alcoholics. So when things were bad, it wasn’t surprising for Neil to turn to drinking. And they were. He was so depressed he thought about suicide. Often. But he still cared about making movies. He sat down and wrote a script. It was supposed to be fiction but it was his own life, more or less. The Playing With Time Foundation approved his application for the second time and he got enough money for a week’s shoot. But his own healing wasn’t over yet. Perhaps it will never be. The season opener that year for the Degrassi series was a shocker. Both Wheels’ parents are killed in a car crash, a plot which was not entirely a coincidence since so much of what happened in the television show was regularly reflected in the real lives of the actors. Neil knew it was helping to have a lot of his personal life go into the television show. But when it came time to shoot the funeral scene and he entered the church and saw two caskets, he lost it. These were empty coffins which were supposed to contain Wheels’ parents; but Neil couldn’t act any more. What he saw there were the two caskets of his brother and his father. “We had to stop shooting because Wheels wasn’t supposed to cry because he was angry. But I couldn’t keep it back any more”, he says. Which is also the last thing Neil says in his documentary. That’s not what you go public about alcoholism for, he says. You go public, you make a movie if you’re Neil Hope and that’s what you want to do for the rest of your life. Or if you’re not Neil Hope but you do have an alcoholic at home, you tell a teacher, or a friend or a support group because you finally understand – and believe – it is not your fault.